In ice rescue situations, hovercraft can quickly reach victims. During Ice Rescue, time is critical – when a person falls through the ice, they quickly loose body heat and hypothermia affects muscle control and can place them into shock. Victims don’t have time for rescuers to get dry suits on, or try to reach them with body boards. Ice rescue boats are useless, hovercraft fly over any flat surface, so can save lives during ice rescue emergencies. Normal body temperature averages 98.6 degrees. With hypothermia, core temperature drops below 95 degrees. In severe hypothermia, core body temperature can drop to 82 degrees or lower. Confusion and fatigue can set in, hampering a person’s ability to understand what’s happening and make intelligent choices to get to safety. You may have traditional equipment, but realistically you cannot hope to throw a rope and expect the victim to have the muscle strength or clarity of mind to catch it. Failure to reach the victim can quickly lead to death by drowning. Gear such as ice boards only place rescuers in danger. Hovercraft save precious time. The rescuers don’t place their own lives in danger trying to reach the victim. 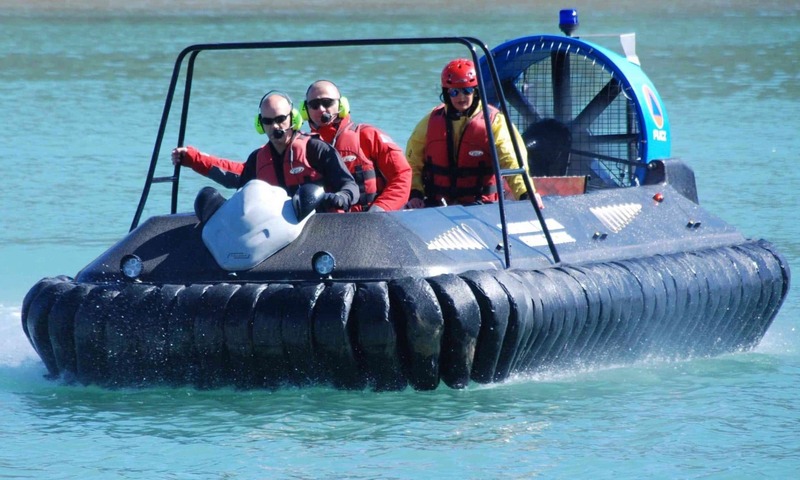 Hovercraft provide a platform for rescuers to remain safe, and can quickly transport the victim to a waiting ambulance or someone able to administer first aid for immediate medical attention.